So it's half term already and as usual it's cold. Today we have plans to bake and chill out with some books. As a mum, and a teacher, I am always on the lookout for new books to entertain the children - and hopefully educate them along the way. As luck would have it I have a lovely friend, Ian House, who is not only super talented with animations and illustrations but has also turned his skills and imagination to producing his first children's book. 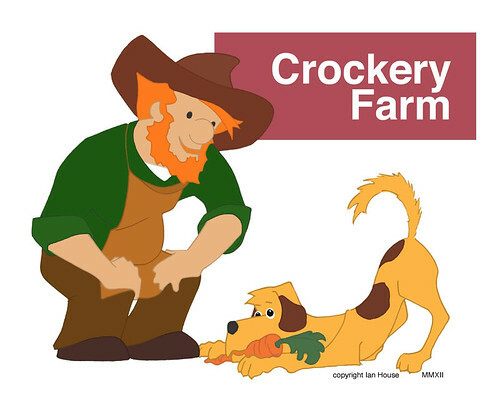 Crockery Farm tells the tale of Pete, a young boy who is far from enthused by the dinner on his plate. However, an unexpected trip to Crockery Farm, and a meeting with Giles, takes him on a journey of learning and appreciation. The concertina layout and imagery grabbed Edith's and Alban's imaginations. "I liked it when Pete got onto his plate of food! Normal books just turn pages and this one is more exciting because you get to open it up and you could put it on your wall." "I actually loved it. I liked the dog in it and it's got trees that we eat! That's the funny part of it. 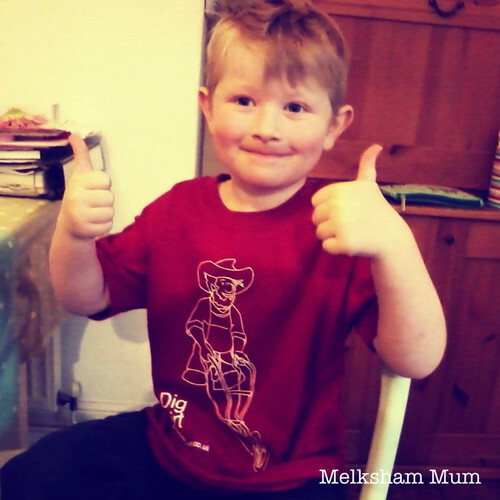 I also like the farmer in it who is on my shirt." 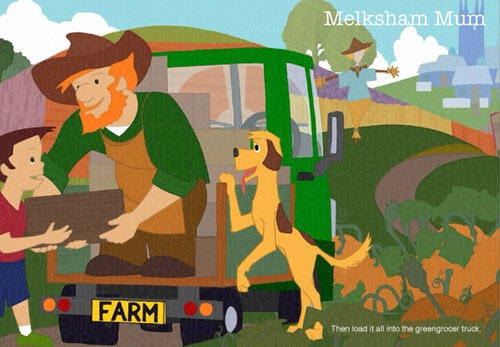 With my teacher hat on I have to say that the message the story gives its readers about the journey of food from farm to plate is an important one. I have recommended it to other staff at my school as its focus fits in perfectly with our upcoming topic of Tractors and Turnips. Ian has provided two copies of his book to giveaway right here. All you need to do to be in with a chance of winning is to leave a comment below telling me what plate of food you would like to fall into and why! Please also leave your twitter tag or contact link. 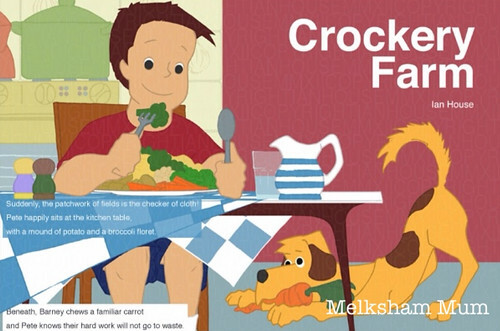 For an extra slip of paper with your name on it to go into the hat tweet the link to this competition mentioning @MelkshamMum and @crockeryfarm. Competition closes midnight Saturday 16th February 2013. Disclaimer: The views published here are my own and my children's. I have received no payment for this post. I have tweeted as @caro_mad. Ooooh I think it would have to be Rhubarb crumble and custard!!! Roasted red peppers and cheese! The plate of food...hmmm...definitely pancakes (English pancakes), with golden syrup lemon and sugar...and an ice cream soda on the side (chocolate ice cream and sprite) yehh!